This is a 7 mile long walk with some gentle hills and slopes. After leaving Howtown pier we climbed a bit until we reached the hillside. Here the scenery is breathtaking. In good weather you can even see Pooley Bridge. The weather was really nice with beautiful clouds in the sky. I had to stop for taking a couple of shots for a panorama. For me the best part of path was when we reached the Scalehow Force waterfalls. There is a small wooden bridge to cross the river. If you walk left after crossing it you will find the falls. You could spend here hours if you like photographing running water. As I didn't bring any tripod with me I only took one exposure after holding my breath for a second. Soon we reached the southern part of the lake. The scenery is again breathtaking here. This walk truly deserves its reputation. In Glenridding we stopped for a little snack and drink then caught the next steamer taking us back to Pooley Bridge. This walk became my wife's favourite during our stay. The next day the forecast said some rain for the afternoon. That's why we left right after breakfast. 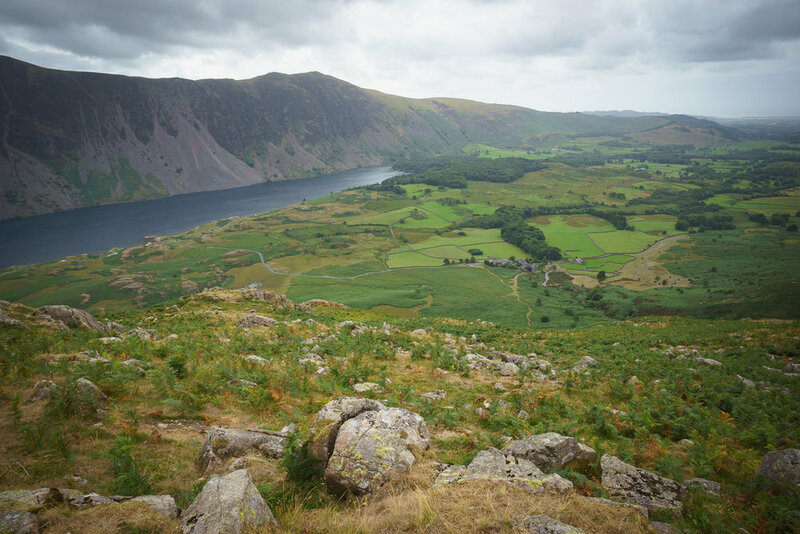 I found a walk described on the National Trust's website running on the western side of the Wastwater lake. It's climbing along Greendale Gill. The walk itself is only 3.5 miles but there are some steep parts as you have to get to the top of Middle Fell. It was very misty when we arrived. As the Sun got stronger it managed to break through the clouds and mist creating the most magical atmosphere I experienced during our holiday. I took a shot while hiking and it became my favourite shot despite the known weakness in the composition. It was really relaxing to walk along the stream. At these early hours of the day we were the only hikers there. A couple of times we stopped to drink and to take some shots of the gill. This was one the best. Reaching the plateau the path became a bit boggy. We had to take careful steps, it was like walking on a sleeping mattress. We had a couple of bites at Greendale Tarn and then we started to search for the narrow path mentioned in the trail description. We couldn't really find any kind of path so we kept to the shore of the tarn and then roughly headed to the distant rocky outcrop using the OS maps app on my phone. Finally we found the joining path and started to head back. The trail were still climbing. The wind got colder and stronger as we got closer to the peak. From the top, 582m, you have a 180 degree view of Wastwater, crying for a panoramic image. I used the Zeiss Sonnar 55mm F1.8 for the panorama and also took a single shot with the Zeiss Loxia 21mm F2.8 using the rocks in the foreground. From here the path starts to descend. Before the last steepest part of the trail I stopped for an image looking down to Greendale.